If you’re the type of person who likes to buy local, consider one of these top-rated European made menstrual cups. All these period cups are made in Europe of the highest quality medical grade silicone and would make an excellent choice. The Mooncup belongs at the top of any European made menstrual cups list because it’s one of the most reputable menstrual cup companies in the world. And, to put it simply, they make an excellent product! The Mooncup is made in the UK and is one of the few menstrual cups that is approved by the American FDA.The Moon Cup also has some excellent customer reviews and ratings online, and thousands of very happy customers. One of the best things about the Mooncup is that the company sells it through their website if you’d like to buy directly from them. It’s just under 20 Pounds, shipping is free worldwide and your order should arrive in two weeks at most. A common question is how does the MoonCup compare to the Diva Cup? The truth is that these two menstrual cups are very similar. In terms of design and manufacturing, they’re almost identical. They’re also quite similar in terms of fit, insertion and removal. In reality, you couldn’t go wrong with either of these menstrual cup brands. They’re both old, established companies that sell excellent products at a reasonable price. If you live in the UK, go with MoonCup. If in North America, go with the Diva Cup. The Lunette Cup is another high quality European made menstrual cup that makes an excellent choice for people looking to buy their first cup. It’s made in Finland and many people report that it didn’t leak, unlike the Diva Cup which many of them tried first. It’s a little bit stiffer than the Diva Cup, which can make insertion a bit easier. Once you fold it, and then insert it, it should just pop into place. After that, the Lunette Cup has some serious suction and will stay in place. Some people find this comfortable, while others don’t. It’s purely a matter of personal preference. The small size has one of the shortest lengths and smallest diameters among popular menstrual cup brands (see: Menstrual Cup Comparison Chart), making it an excellent choice for a smaller people. Lunette is a really solid company and although their cup is a bit more expensive than some of the cheaper options, it’s the highest quality. It’s a cup that many beginners start with, and it’s so good that many stick with it for their entire lives. Check out the reviews for yourself on Amazon and you’ll see thousands of extremely satisfied customers. FemmeCup: One of the European made menstrual cups. The Femmecup is manufactured in the UK and certainly belongs on any list of top quality European made menstrual cups. It’s made from the highest quality medical grade silicone and comes in only one size. It’s thin and pliable which makes insertion really easy-it should just snap into place. 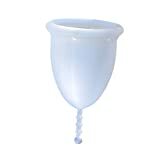 At 60 mm in length, it’s one of the shorter cups on the market which can make it quite a good choice for women with a low cervix/short vaginal canal. The Yuuki Cup is another European made menstrual cup which has a high rating on Amazon. It’s manufactured in the Czech Republic from the highest quality medical grade silicone. It’s a bit unusual in the menstrual cup world is that there are two models: classic and soft with different levels of firmness. All other cups don’t differentiate and offer only one choice of firmness, but a variety of sizes and colours. People who experienced leaking with something like the Diva Cup raved about the Yuuki Cup after making the switch. They have thousands of happy customers. The Yuuki also comes with an “infuser” which allows you to clean your menstrual cup in the microwave really easily. Although the Merula Menstrual Cup is a regular length to start with, it’s designed so that you can cut the rings off to make it one of the shortest menstrual cups. This makes it a nice option if the average length menstrual cups are too long for you. At 50 ml, the XL Merula Cup is the highest capacity menstrual cup you can buy. This makes it an excellent option if you have a very heavy flow and find that you have to change a tampon or average capacity menstrual cup way too often. The Si-Bell Menstrual Cup is made in France from top-quality, medical grade silicone. The unique thing about this period cup is how soft it is-it’s one of the softest menstrual cups you can buy. Some people love soft cups because they’re very comfortable. Others don’t like them because they can be a bit more difficult to insert. Soft menstrual cups don’t just pop open easily inside of you like the firmer ones do. In reality, it’s up to you, but we generally recommend that beginners stick with a firmer menstrual cup. The Si-Bell Cup is very similar to the more popular, American made SckoonCup, both in terms of firmness, as well as design. They both have excellent customer ratings and reviews and most people seem very happy with both of these soft menstrual cups. The Selena Cup is made by an Austrian company and it’s just come onto the market in the last couple of years. It’s made from top-quality, medical grade silicone from Germany. The Big question we have about the Selena Menstrual Cup is where exactly it’s manufactured. The company doesn’t give any details about this on their website, and we were unable to find the details anywhere online. Our guess is that it’s made in China, but that the company didn’t want people to know about this. It’s not that menstrual cups made in China are necessarily bad. The Ruby Cup, for example is a very decent menstrual cup that’s made there. It’s just that most of very cheap menstrual cups that you shouldn’t put into your body are from there. Despite this uncertainly, it is a top-quality menstrual cup that comes in a wide range of sizes (small, medium, large) and firmness options (regular, Aktiv/firm), so there’s something for everybody. For more details about this Austrian menstrual cup, check out the full review: Selenacup Review. What are your favourite European Made Menstrual Cups? Leave a comment below and let us know your thoughts. Also be sure to give this article a share on Facebook, Twitter, or Pinterest. You left out the Iris Cup which is made in Spain. I’ve been using it for 4 years now and it i wonderful! I live in the UK so the Mooncup is kind of an obvious choice for me with the free shipping option directly from the company. But, I’m just wondering if it’s the best menstrual cup, or should I give one of the newer ones a chance? I’m considering the EvaCup, or the Super Jennie because I have a bit of a heavy flow.